Once upon a time, it was unattractive to travel in Nigeria when walking was the only available means of transportation. Our forefathers actually travelled from Lagos to Ilorin and even to Kano on foot and arrived at their destinations after several days or months. They had no other option; they just had to move between geographical distances in search for ways to meet their everyday needs. When animal transportation came to the scene, moving around was a little less stressful; but, this alternative wasn’t for everyone. It was mainly for those who could afford it. Later on, water transportation – which involved the use of canoes, boats, and ships, on canal, rivers, lakes, and ocean – was embraced. This made travelling faster and easier. Then came rail transportation, the first modern means of transportation in Nigeria and automobile cars for land transportation. Advancements in technology led to the emergence of the aircraft, one of the fastest means of human transportation in the world today. Its speed advantage makes it possible to transport people to their desired destinations in no time. In Nigeria, the history of the aviation industry can be traced back to 1925, when a British Royal Air Force Aircraft landed in the ancient cities of Kano and Maiduguri. The air trip led by the Late Flight Lt. Coningham began from Helwan (a town in Egypt) to Kano, with several stopovers in Egypt, Sudan and N’Djamena. As the era of commercial aviation set in, air transportation became more embraced in Nigeria and West African Airways Corporation was founded in 1946. It was jointly owned by the governments of Britain’s four West African colonies, namely Gambia, Ghana, Nigeria, and Sierra Leone. Nigerian Airways succeeded the defunct West African Airways Corporation in 1958. It operated as a Nigerian government owned airline until it ceased operation in 2003. Today, there are about 16 active domestic airlines operating from 30 domestic airports in Nigeria. The airlines are Aero Contractors, First Nation, Azman Air, Dana Airlines, Kabo Air, Arik Air, IRS Airline, Air Peace, Chanchingi Airlines, Med-View Airlines, Overland Airways, Pan African Airlines, Discovery Airline, Oriental Airline, Verista Airline, and Associated Aviation. There are also a number of international airlines and, now, 17 international airports within the country. Data released by the National Bureau of Statistics (NBS) shows that there were 41,953,285 international and domestic air passengers from 2014 to 2016. This might seem like a huge number, but it doesn’t quite present the current state of air travel in Nigeria. In this article, using data from NBS, we use available data from NBS to discover interesting trends about air travel between 2014 and 2016. Let’s take off! 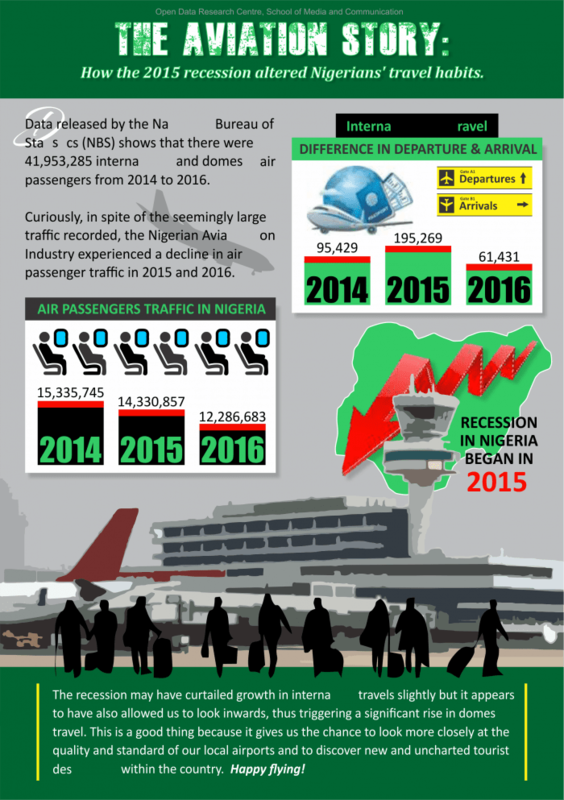 Believe it or not, in spite of the seemingly large traffic recorded, the Nigerian Aviation Industry has experienced a decline in air passenger traffic in 2015 and 2016. According to the data, air passenger traffic in 2016 was 12,286,683 compared to 14,330,857 in 2015. This is a downward trend which began in 2015 after a peak in 2014. Chart A shows this trend. The data further shows that the decline was driven by a decrease in the number of international travellers. 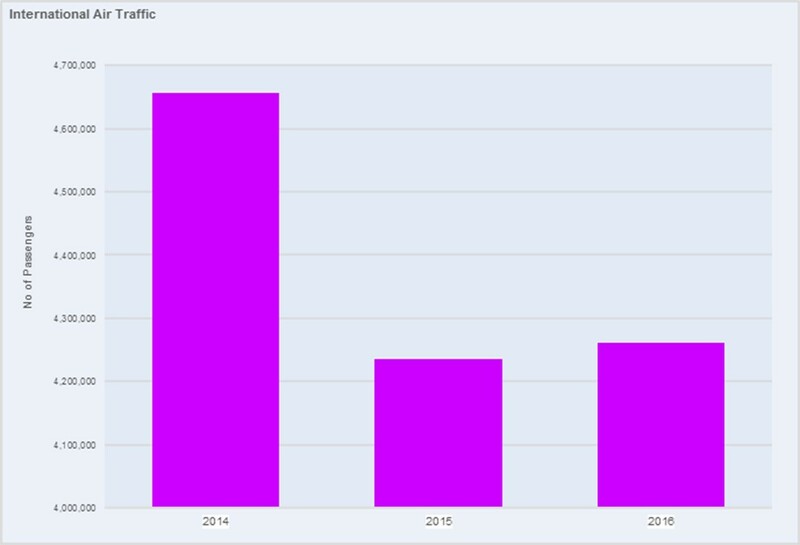 Indeed, taking a look at Chart B, it will be noticed that the number of international passengers in 2016 (1,315,075) was only about a third of what was recorded in 2014 (4,656,955). What could be responsible for such drastic decline especially between 2015-2016? Let’s pause for a while and turn to the domestic passenger traffic to see the trend. 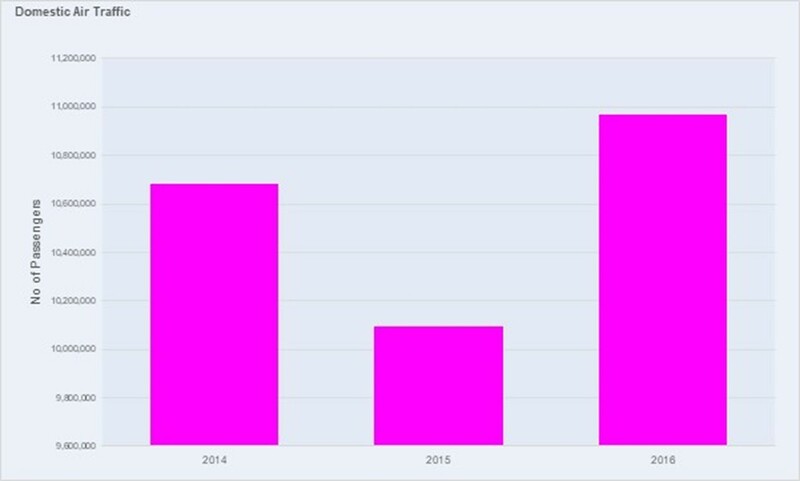 Chart C shows that the number of domestic passengers increased in 2016 after the 2015 decline. 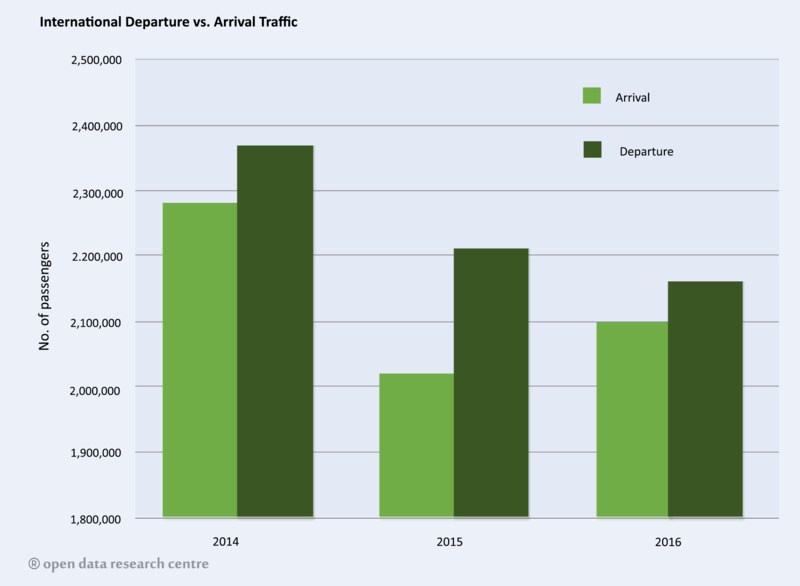 Although the increase did not have any significant improvement on the overall decline rate (from Chart A), interstate air travel seemed to have had a push up in 2016 – in fact, it was higher than the traffic in 2014. How can we explain this? Is it possible that Nigerians suddenly realized the need to travel to other states within the country? How is it that they only woke up to this fact after 2015? Could it be that there are more exciting travel destinations in Nigeria now than we had before? We address these issues in the next section. 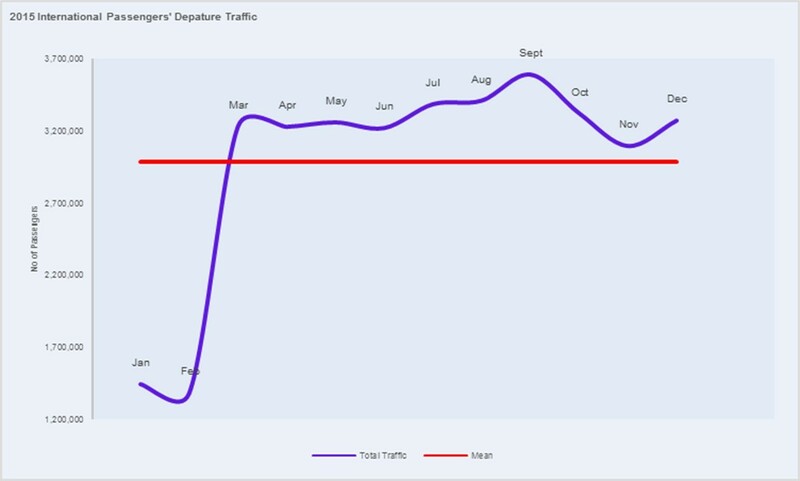 Examining chart D, one would notice that the traffic for international departure exceeds that of arrival for all the three years under scrutiny. All airports including Lagos and Abuja – which are the top two international airports in the country – experienced the same trend. From this, it may be possible to infer that more people left the country than returned during those three years. Interestingly, of the three years, 2015 recorded the highest departure rate. Here again, 2015 is drawing attention. Could there be more to that year than we know so far? Recall, the recession began in 2015. The economy began to experience a decline; trade and industrial activities were critically affected, the country’s GDP fell and Nigerians were thrown into economic difficulty. For most people, life became pretty tough. Coincidentally (or not), the international departure rate at airports suddenly increased (see Charts D & E). Did Nigerians (at least, those who could afford it) leave the country in search of greener pastures shortly after the new government came into power and just as the country was plunged into economic hardship? Or could it be that some expatriates returned to their home countries for good due to the economic meltdown? A further breakdown of the data gives more answers. Who left the country and did not return? In 2014, before the recession, the average international departure rate (represented by the red line in Chart F) was about a thousand more than the average arrival rate (depicted by the red line in Chart G). 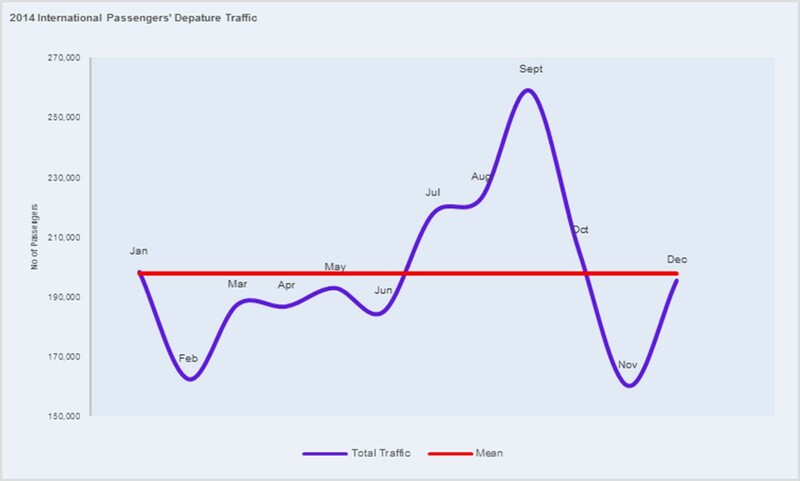 Departure was below average for the first six months of the year and began to rise above the mean from June to October. So, when the economy was friendly, it appears that more people were able to travel out of the country for summer (which usually begins in June). Arrival peaked in October (after summer) and during the festive period in December. Quite a number of international travellers also returned to Nigeria in January 2015 to either celebrate the new year or resume at their respective places of work. The recession officially began in 2015. In that year, average departure (2,987,353) was way higher than average arrival (177,811). 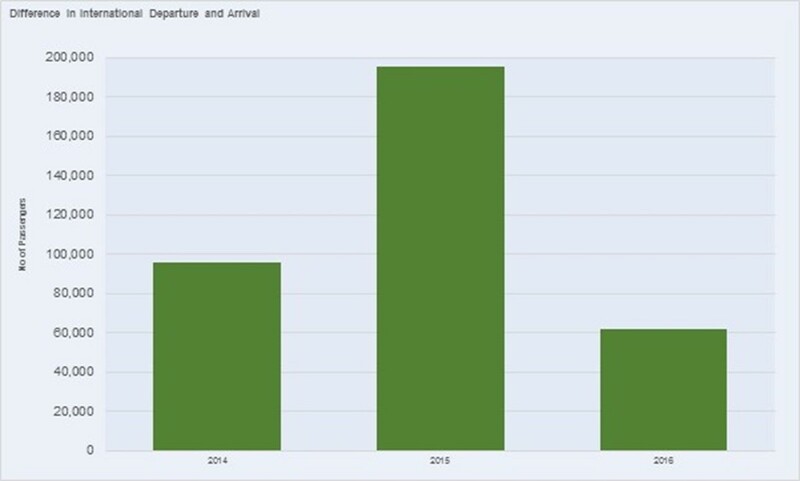 Departure was above average throughout the year except in January and February. Departure also peaked in several months (March, May, July, September, and December). 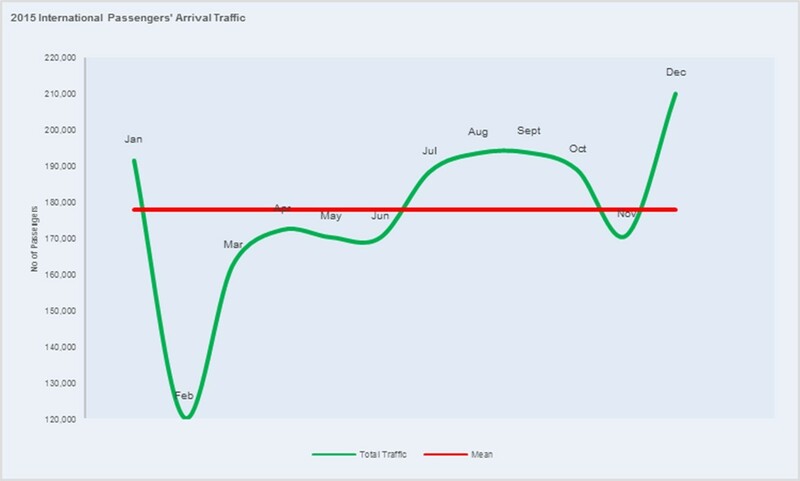 Arrival was below average in six months (February, March, April, May, June, and November). It peaked in January, July through October, and in December. This seems to indicate that on the average, many departed from Nigeria during the period of recession, unlike the previous year. Although the number of passengers who arrived the country spread over several months, the arrival rate did not correspond with the departure rate. For this reason, it appears that many did not return to the country in 2015. Charts H and I tell this story visually. In 2016, the economy became tougher and average departure rate dropped from 2,987,353 in the previous year to 1,052,194. This is less than half of 2015’s. Departure was below average for ten months except in January and September. It might be suggested that many left the country at the beginning of the year to escape the harsh economy while others had to save up money for several months to afford summer trips. Meanwhile, average departure (1,052,194) was higher than the average arrival (54,630) in 2016. However, Arrival peaked in July and September but, the number of travellers who returned to the country in 2016 cannot be compared to those who departed the country. This can be seen clearly in Charts J and K.
So, who were the emigrants? At this stage, it might be possible to surmise that emigrants were Nigerians who went out in search for greener pastures. However, they could also have been expatriates. Yet, it can be argued that expatriates were at the positive end of the financial recession since, unlike Nigerians, they enjoyed increasing purchasing power as the country got tougher and the naira dwindled; they benefited from the inflation in exchange rates since most of them are paid in foreign currency. Therefore, it’s perhaps more likely that more Nigerians left the country as this report suggests. In 2016, ten airports became operational and were included in the aviation data for that year. These airports were in Asaba, Eket, Gombe, BirinKebbi, Bauchi, Dutse, Zaria, ESCRAVOS, FINMA, and FORCADOS. 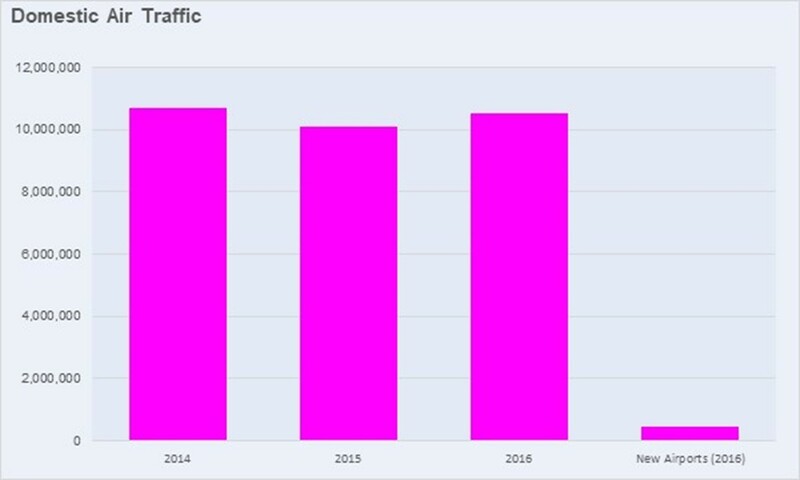 Clearly, this would have contributed to the increase in traffic recorded in 2016 (see Chart L) since new airports could also mean new destinations for air travellers. Finally, we examine the arrival and departure trends for the most visited six states in the country. It will be interesting to know where Nigerians travelled to and when. As seen in chart M, Lagos has the highest number of passenger traffic for three years and Abuja ranked second. Lagos and Port Harcourt’s traffic dropped in 2015 and 2016 respectively while Abuja’s increased in 2015 and 2016. Owerri and Enugu passenger traffic only increased in 2016. From the charts, it can be seen that Lagos, Port Harcourt, Owerri, and Enugu, peaked in March and April – months when Christians celebrate Easter. Usually, the Federal Government declares Good Friday and Easter Monday as public holidays. 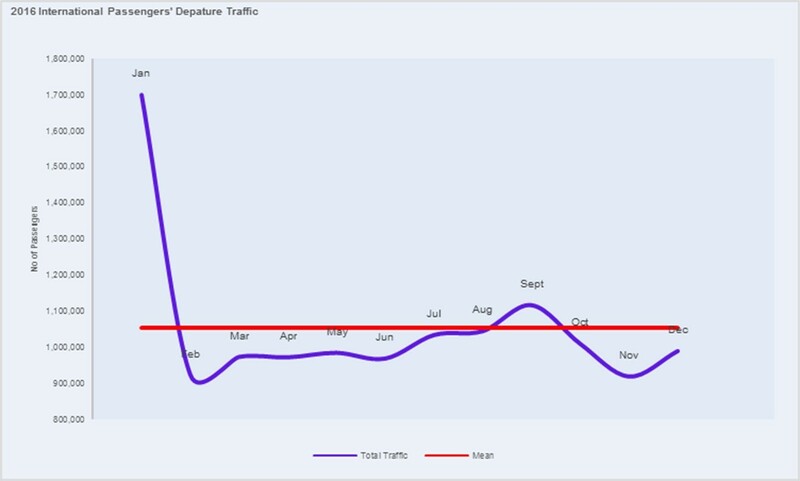 The data shows that more air passengers’ left from Lagos and Port Harcourt than arrived during these festive periods. 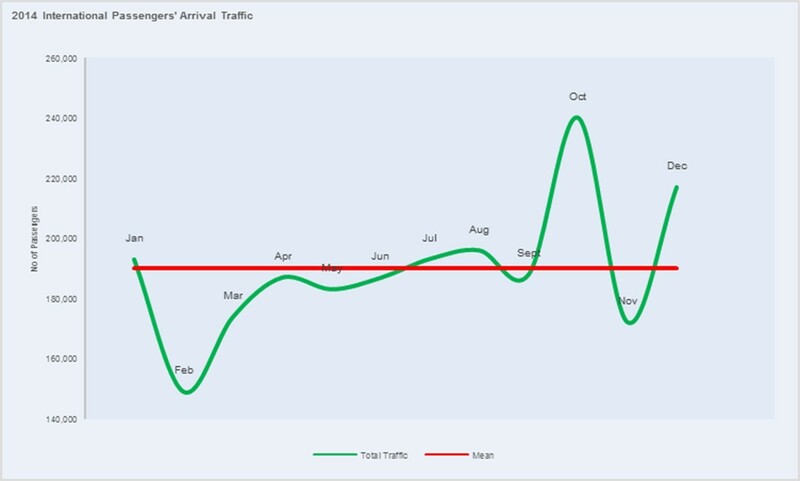 Owerri and Enugu had about an equal number of passengers’ traffic in the same months except in 2014 when Owerri had more arrival than departure traffic in the months of March and April. It would, therefore, seem that some Christians travelled to and fro these destinations for Easter celebration. Lagos, Port Harcourt, Owerri, Enugu, and Kano also peaked in December. December is significant because it marks the year-end for many organizations in Nigeria and it is also the Christmas festive month. Many people travel during this holiday season. 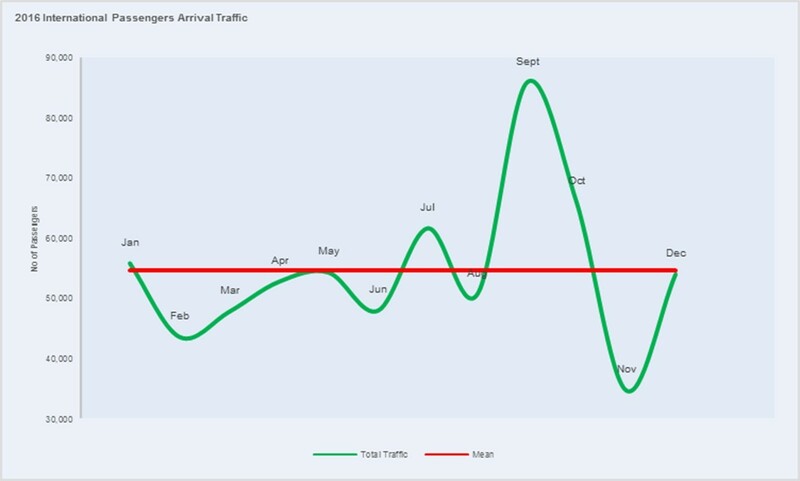 From the data, while more air travellers departed from Lagos than arrived in December, Port Harcourt, Owerri, and Enugu had more arrival traffic than departure. Just for the curious, there are indeed interesting travel destinations in these places; Ngwo Caves, Waterfall, and Pine Forest, Ezeagu Tourist Complex, Port Harcourt Tourist Beach, Owerri Amusement Park, Mbari Cultural and Art Center are some of the fun places that travelers may visit in Enugu, Port Harcourt, and Owerri. 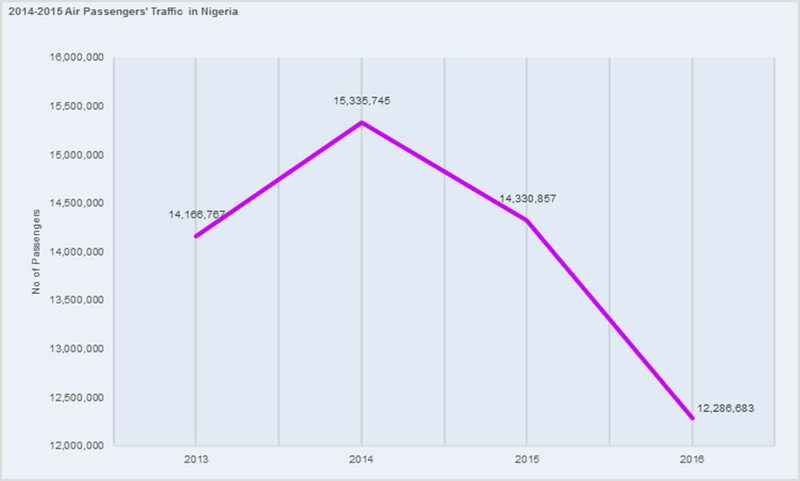 Meanwhile, in comparison with trends in the southern states (which are predominantly Christian), Kano and Abuja provide some interesting findings: traffic for March and April also peaked there. How can this be explained? Since Abuja has a blend of the two religions in almost an equal proportion; the peak is probably understandable. But how can one explain the situation in Kano, a core Islamic state with high arrival and departure rates during Easter period, including June and July? One very conspicuous reason for June/July peak is the Islamic festival known as Eid al-Fitr. The religious holidays mark the end of the Islamic holy month of fasting and the federal government also declares public holidays during this season. Some Muslims may have travelled in and out of this state for the festival – hence, the spikes. Air travel in Nigeria has come a long way since 1925 when the first aircraft touched down in Kano. Although Nigerians are not ranked among the most travelled people in the world, our aviation industry has arguably grown significantly over the years. The recession may have curtailed that growth slightly but it appears to have also allowed us to look inwards, thus triggering a significant rise in domestic travel. This is a good thing because it gives us the chance to look more closely at the quality and standard of our local airports and to discover new and uncharted tourist destinations within the country. Happy flying!